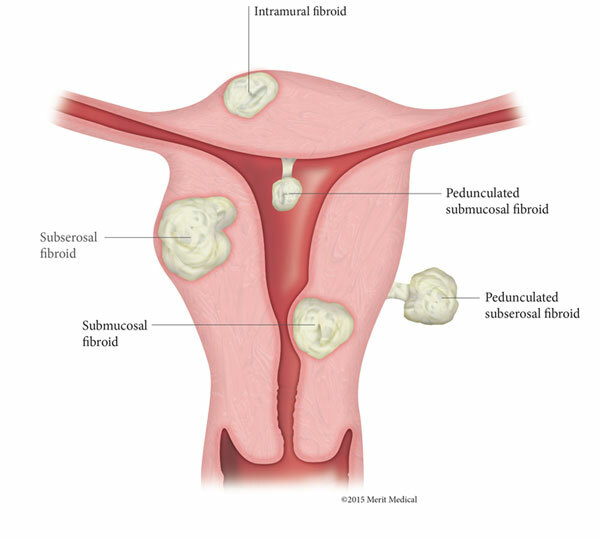 Uterine fibroids are benign (non-cancerous) tumors that grow on or within the lining of the uterus. They can range in size from as small as a grape to as large as a cantaloupe. 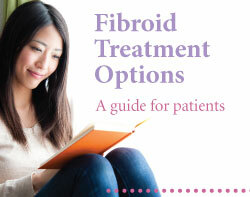 Approximately 20-40% of women over age 35 have fibroids. African-American women are three times more likely to develop them. Fibroids can result in pelvic pain or discomfort, urinary incontinence, frequent urination and heavy menstrual bleeding. The location and size of uterine fibroids can affect the severity of these symptoms and impact your quality of life. Fibroids are also hormonally sensitive, so the symptoms can be cyclical, just like with menstruation. Hormone treatment medication. This can help relieve symptoms such as heavy menstrual bleeding and pelvic pressure, but cannot eliminate fibroids. Medication can also cause side effects, such as weight gain, vaginal dryness and infertility. 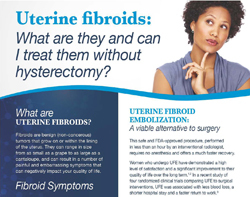 Surgery, in the form of hysterectomy (removal of the entire uterus) or myomectomy (removal of fibroids from within the uterus) are options that are used today. Myomectomy is the preferred treatment for women who wish to become pregnant, and/or to improve their chances for becoming pregnant. However, fibroids often return within a few years of having this procedure. 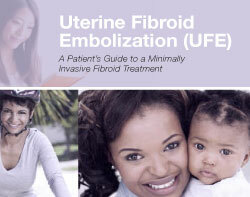 Uterine fibroid embolization (UFE). This less invasive, FDA-approved and highly effective approach for treating fibroids is performed by a specialized doctor called an interventional radiologist, who uses X-ray imaging to guide a catheter through the femoral artery in the groin to the uterine artery. When the catheter has reached the location of the fibroids, the radiologist embolizes or “blocks” the blood vessels that feed the fibroid, depriving it of oxygenated blood. 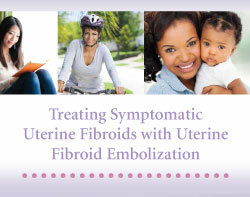 The fibroid then shrinks and the symptoms gradually disappear. UFE is performed on an outpatient basis. It takes less than an hour, and the patient may return home within 24 hours after the procedure. 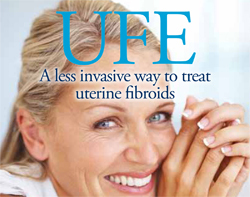 It is not known the long term effects that UFE has on a woman’s ability to become pregnant. If you decide on UFE, becoming pregnant in the future can be extremely difficult; although some women have had successful pregnancies after UFE. As with all medical procedures, talk to your doctor if you have questions, and to help determine if UFE is right for you. Obstet Gynecol. 2009 May;113(5):1027-37. doi: 10.1097/AOG.0b013e3181a11c64. Ovarian conservation at the time of hysterectomy and long-term health outcomes in the nurses’ health study. Parker WH1, Broder MS, Chang E, Feskanich D, Farquhar C, Liu Z, Shoupe D, Berek JS, Hankinson S, Manson JE. Smith WJ, Upton E, Shuster EJ, Klein AJ, Schwartz ML. Patient satisfaction and disease specific quality of life after uterine artery embolization. Am J Obstet Gynecol. 2004;190(6):1697–1703.